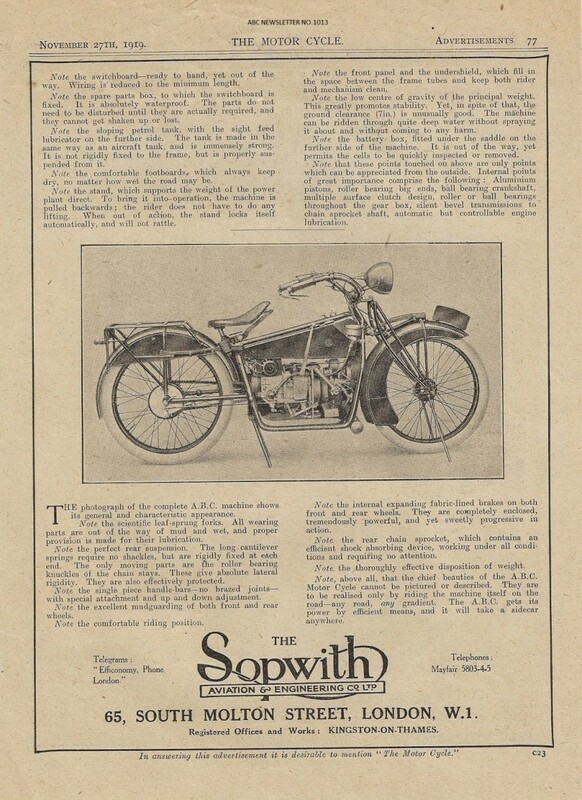 I recently came across a remark in an old email that my Newsletter writings are centred on Sopwiths, with (in particular) very little about the Skootamota. This is certainly so: what ABC expertise I have is limited to the transverse flat twin model. May I remind you however of the terms of reference and aims of the Newsletter as stated in Issue No. 1001, that it will rely mainly on incoming contributions. This is not a gripe: I find it an agreeable mental recreation, about once a month, to write a page or two for the 'letter, but the rest is up to you! I posed a question in the last Newsletter, about the (removeable) toolbox referred to in the "Stand 23" advertisement, located beneath the "crank chamber". Soon after that, I remembered a rather different box that came with my basket-case of Sopwith bits, in 2011. It is a squarish welded sheet-aluminium container with a pressed-on lid, evidently intended to live above the petrol tank, ahead of the saddle. To this end, its bottom is humped to straddle the frame tube.I have come across odd references to such a box, but never seen one on a machine. In truth, its lightness would limit its use to sandwiches rather than tools! Its intended mode of fixing is also unclear. Comments, anyone? No remarks have come in concerning the 'Shuttleworth' photo that appeared last month. However, a trip to the Sopwith archive has shed some light. "EK" was the property of a Mr. G. Lambert, then of South London, who seems to have distrusted the new-fangled electric lighting system. "MF" was "rebuilt from two bikes, one from London, one from Scotland, by a Mr. B.W. Hinds", who had only one leg: hence the footbrake pedal on the nearside! This is according to the machine's next owner, a Mr. C. Hodgins of Bicester (at about the time that Bob Thomas lived there). Note the front wheel drive speedo. A photo of the RHS of this machine appears in "On Two Wheels", (Vol. 1, Part 1, p.9). Noteworthily, on p.8 of this book is a photo of Eric Thompson's old machine, XK6686 (see picture in Newsletter No. 1005), which also sports a portside brake pedal! The world is now the richer by a serviceable Sopwith crankcase, serial no. 1818! My 2011 basket case included most of a spare engine, but its front main bearing had spun in the crankcase, and a clumsy attempt had been made to repair it. This has now been properly attended to, and sleeved back to original size, mostly on my Colchester Triumph lathe, another dinosaur, vintage 1934. The Bonhams October (Stafford) Auction Catalogue is not yet fully detailed. The ABC Sopwith that it contains looks to be fairly complete and original, except for a set of speedway handlebars, and dark red livery: its provenance could prove to be interesting! (Since writing this, I've been to the Beaulieu Autojumble, where this machine was on show, outside the Bonhams tent. PC1033 has evidently had a chequered history. Unusually, the Frame and Engine numbers match (2853), but Gearbox (1843) and Bevelbox (1447) are from far different homes. The D. Hales Register indicates that this machine was once the property of George Milligen of Norwich: from the machine's condition, one wonders if George was a blacksmith working on a tight budget). A little more on the Beaulieu theme, Howard & Lorna were there, and Steve & Carol, with their new double pitch, close to their usual location on the 'yellow field'. Giovanni visited on the Saturday, but had the misfortune to get a front-wheel puncture on his way home. ABC material was scarce there: apart from the Bonhams machine, I saw only a Scorpion aero engine, for a silly price. This is the second half of the advertisement shown in the last Newsletter, associated with Stand 23 at Olympia in 1919. The 'handlebars with no brazed joints' design-feature was seemingly revised to the style we know, with a fattened mid-section, before series-production began. Harking back to the opening paragraph, would it be a good idea to introduce a system of Newsletter Guest Editors, each of whom would compile a whole Issue, with the accent on his particular field of ABC expertise? Kim on Stationary Engines, Peter on Skootamotas, and David on Early ABC/Gnome et Rhone History, spring to mind. Any offers?